Two minutes before the Woolsey Fire broke out last week, ultimately becoming one of the largest fires on record in L.A. County, there was a brief outage at a nearby Southern California Edison substation. It's too soon to tie that event to the devastating fire that ignited shortly afterward — investigators have just gotten started on the cause — but there's reason to take a hard look at power lines. That's because electric utilities' equipment starts about 10 percent of all wildland fires in California. Those fires are responsible for an outsized portion of acres burned — up to 50 percent — because they often occur during the worst conditions, high temperatures, high winds and low humidity. As fires in the state get more frequent, more intense and more deadly, the need to find ways to prevent them has grown in urgency. Have big utilities done enough to reduce their risk? That's a key question, particularly as upgrading an aging infrastructure will be both costly and time-consuming. Earlier this month, Edison International CEO Pedro Pizarro acknowledged in a conference call with investors that the company's power equipment may have been the source of a second ignition point of the Thomas fire. "[Edison] believes its equipment was associated with this ignition," he said, advising investors to brace for a loss if the company is required to cover some or all of the fire damages. The city of Ventura city and dozens of residents burned out by the Thomas Fire have sued Edison for negligence. They claim the company's failure to cut back vegetation and maintain power lines caused the fire that burned 775 homes in Ventura and Santa Barbara counties last December. Remember: It was in that burn scar where deadly landslides took place after rains came in January. Edison announced earlier this year that it plans to spend $582 million upgrading its system so that it's less likely to start fires. Who pays for that? Well, the company is already working on getting required permission from state regulators to pass the cost on to ratepayers. 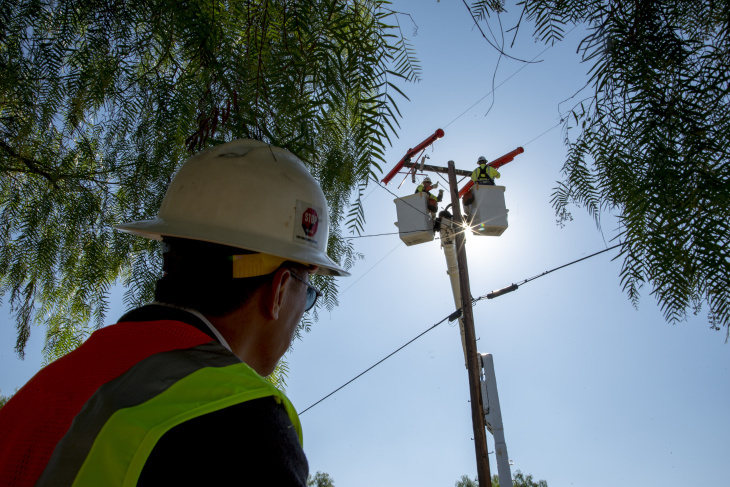 In rural Aguanga, a high fire-risk area outside Temecula, crews are replacing bare power lines with new wires covered in three layers of tough plastic. 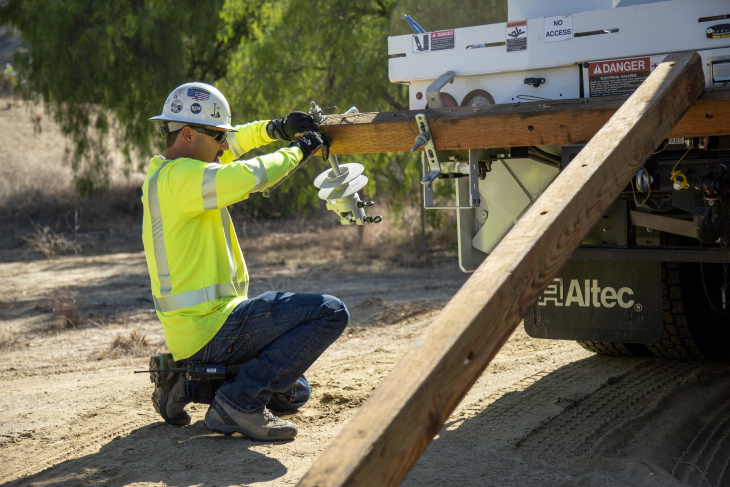 Edison wants to replace 600 of its 10,000 miles of power lines with the covered power lines, which are called covered conductors in the industry. Covered conductors have a thick steel core for strength, surrounded by two layers of aluminum or copper fibers that conduct the electricity. Here's why that's critical: Uncovered conductors can spark a fire when they come into contact with a tree branch, or high winds cause a pair of conductors to slap against each other. 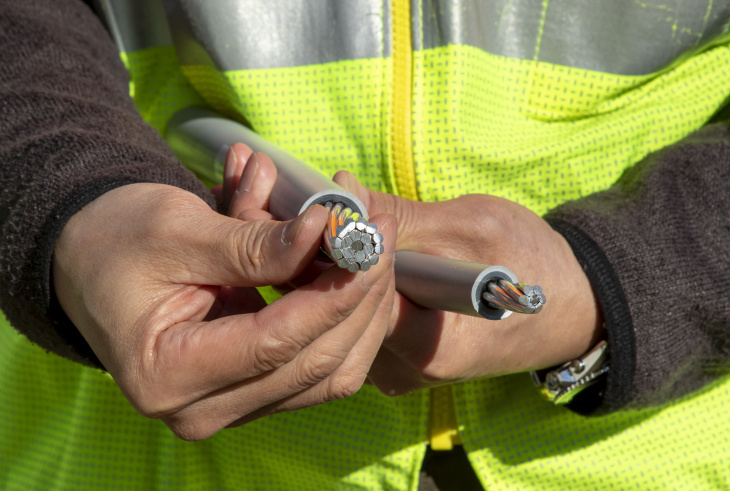 Southern California Edison's Bill Chiu said the covered conductors provide "very robust protection against potential for ignition resulting from palm fronds and tree branches and metallic balloons that get blown into the lines." It's true; a stray palm frond or an errant metallic balloon from a child's birthday party can take out our power grid and set the hillsides on fire. Edison says over half the fires that were started by its power equipment in high fire-risk areas were caused by foreign objects like tree branches, palm fronds and metallic balloons landing on the lines. The use of covered conductors as a way to reduce fires is something new for Edison. It has used older versions of covered conductors as "tree wire" in areas where the wires are likely to touch trees and trimming is impractical. While the new covered conductors have three layers covering the metal insides, older versions have only one or two layers and are more subject to problems, like UV light damage, lightning strikes, sensitivity to radio transmissions and damage from hitting another wire. Covered conductors cost about $428,000 per mile, which is 42 percent more than using bare conductors (a figure that assumes other improvements also need to be made at the time of replacing power poles and connections). But it's far less than the $3 million per mile cost of putting the lines underground. And covered conductors are quicker to install and easier to repair than underground power lines. Edison is taking other steps as well. It will replace some wood poles with fiberglass ones, and it's adopting a more aggressive tree cutting program to keep branches from falling onto power lines. The utility also wants to vastly expand its network of small weather monitors mounted on utility poles in high fire-risk areas. It already has several dozen and it wants to install 800 more. Chiu says the monitors record temperature, relative humidity and wind speed and direction. "Wind is this sort of holy grail of weather prediction," he said. All that data can help Edison decide when and where to shut off power circuits so they can't start a fire on hot dry windy days, said Chiu. The information will be accessible online by fire agencies and anyone else who wants to view it. 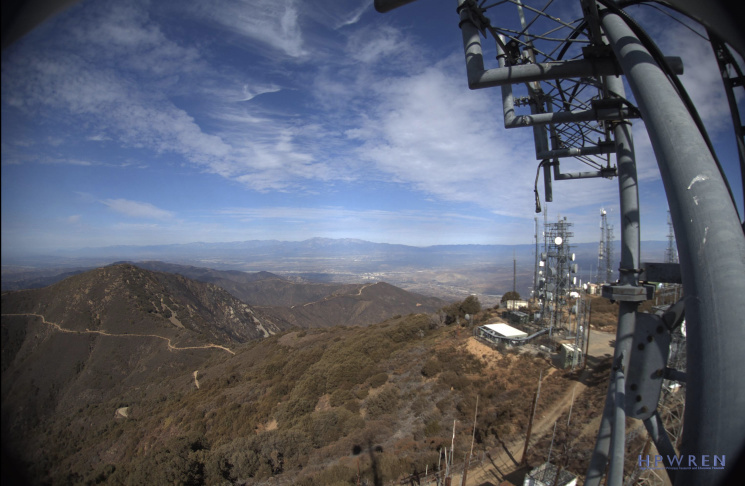 The company also funded new HD firewatch cameras on its equipment tower on Santiago Peak in Orange County. You can see what it sees here. It's pretty simple, fires are getting worse in California. Nine of the 20 most destructive fires in the recorded history of the state have taken place since 2010, a pace that is only accelerating. Why? Climate change and continuous fire suppression have created more fuel and conditions ripe for fire. As the destruction and death tolls mount, utilities' role in causing fires is getting more attention. Cal Fire blames Pacific Gas & Electric's power lines for many of the 16 fires that burned thousands of homes in northern California last year. And PG&E says there was an incident on one of its circuits last week near the origin point of the devastating Camp Fire. This year, Gov. Brown signed into law SB 901, which among other things calls on utilities to harden their power lines, or in other words take a number of steps outlined above, so they don't cause fires. Edison's covers a gigantic territory, serving five million customers. Fires can be costly to the utility — who pays depends on what happens. When Edison's equipment starts a fire but there's no finding of negligence, the company's insurance covers the cost of the damages. If the insurance doesn't cover the full cost, the utility's ratepayers pick up the remainder of the tab. However, if the company is found to have been negligent, shareholders, aka investors, pick up the full cost. But customers may still ultimately see bigger bills. For example, if losses from fires grow big enough, a company's credit rating falls. That makes it more expensive to borrow money — a cost that gets passed on to ratepayers. Keeping power lines from causing fires and destroying homes isn't just good public policy, it is good business. IS EDISON'S WORK TOO LITTLE, TOO LATE? Los Angeles attorney Patrick McNichols represents some Thomas Fire victims. He says the improvements undertaken by Edison, while needed, should have happened long ago. "I would say it's more of an industry-wide practice which has been remiss over the last few decades, which is upgrading, updating all the equipment," said McNichols, who also represents people who lost homes in last December's Creek Fire, which was in Los Angeles Department of Water and Power territory. McNichols says San Diego Gas & Electric sets a good example. The San Diego utility says it has spent $1 billion since a disastrous fire in 2007 to make the same kinds of grid-hardening improvements that Edison is just starting. San Diego Gas & Electric's work so far is "the gold standard for wildfire prevention when it comes to utilities," said McNichols. About $410 million for covered conductors and other grid hardening costs. About $41 million for weather stations, high definition cameras and the software to use them. $131 million for better vegetation clearing, infrared technology to monitor vegetation risks to power lines, and mobile generators for residents to charge phones and mobile devices, among other measures. They want to pass on those costs to ratepayers. If approved, that works out to about $13 dollars a year per household. Edison told the Public Utilities Commission considering the request that Southern California is facing fire conditions that the utility hadn't expected to see for a few decades. "The magnitude of the increased threat and the significance of its consequences did not become apparent until 2017, when CA experienced five of the 20 most destructive fires in its history," the company said in its rate request. The Thomas Fire, which burned more than 280,000 acres, caught the company by surprise, said Edison's Chiu. "Frankly, nobody expected what we saw back in 2017," he said. Since then, the Camp Fire in Northern California has become the deadliest yet, with at least 56 victims and more than 10,000 homes and other structures destroyed.